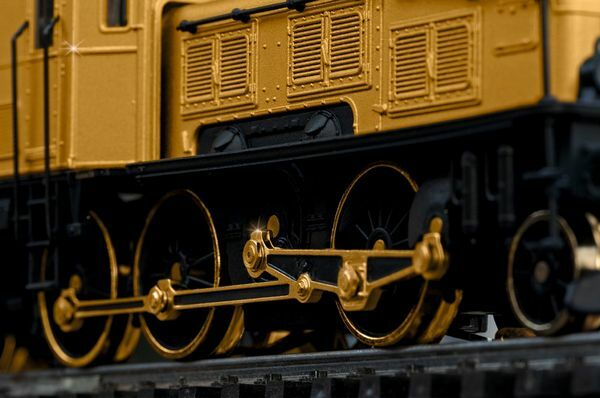 Model: The locomotive hoods, locomotive center part, wheels, side and drive rods as well as various separately applied metal parts are plated with 24 carat gold. The locomotive has an mfx+ digital decoder and extensive sound and light functions. It also has two (2) controlled high-efficiency propulsion systems with flywheels, one (1) motor in each group of driving wheels. 3 axles and jackshaft powered in each truck. Traction tires. 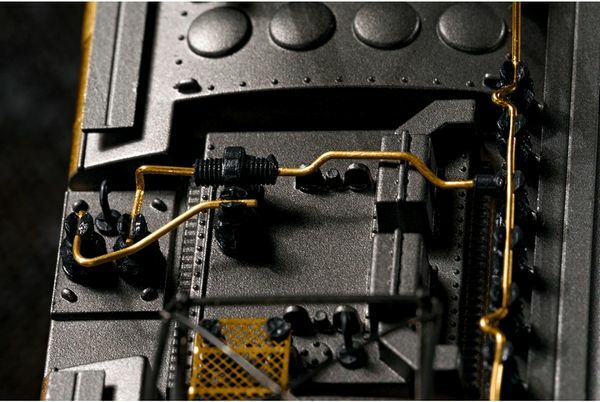 The locomotive frame is articulated to enable the locomotive to negotiate sharp curves. Triple headlights and 1 white marker light (Swiss headlight / marker light code) change over with the direction of travel, will work in conventional operation, and can be controlled digitally. When the locomotive is running "light" the lighting can be changed to 1 red marker light. Maintenance-free warm white and red LEDs are used for the lighting. 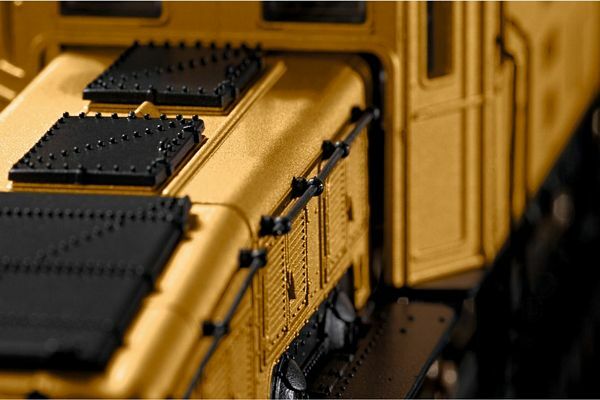 This locomotive is highly detailed metal construction with many separately applied parts. Sanding equipment is included on the groups of driving wheels. The 3-part locomotive body has hoods that swing out. The roof equipment is detailed with safety grills under the pantographs. The "Crocodile" comes in exclusive packaging with a certificate of authenticity. The locomotive and certificate of authenticity are consecutively numbered. A pair of white cotton gloves as well as a booklet about the history of the Crocodile are included. There is also a 24 carat gold plated pickup shoe included to replace the factory-mounted pickup shoe. Length over the buffers 22.3 cm / 8-3/4". 100 Years of the Crocodile – The Heraldic Animal of Märklin A hundred years ago, the Swiss Federal Railways (SBB) placed the first "Crocodile" into operation in November of 1919. These locomotives quickly advanced to the king of the steep grades on the Gotthard. The design derived its name from its articulated hoods, extended shape, and the green paint scheme. The units "snaked" like a reptile through the curves on turnouts and reverse curves. 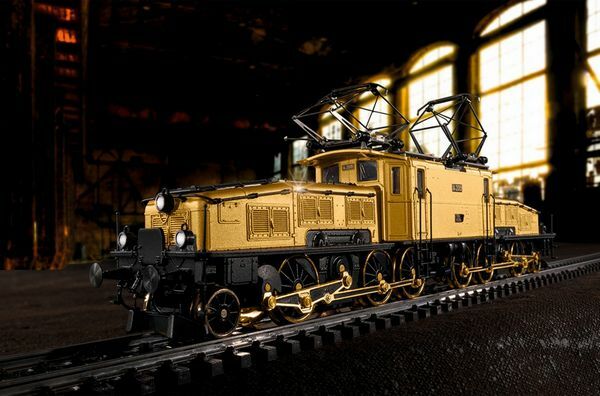 ”Standard gauge six-axle locomotive, only for large curves, faithful reproduction of the 'Crocodile Locomotive' ..." was the way the model of the latest Swiss locomotive was presented in the Märklin catalog for 1933/34. 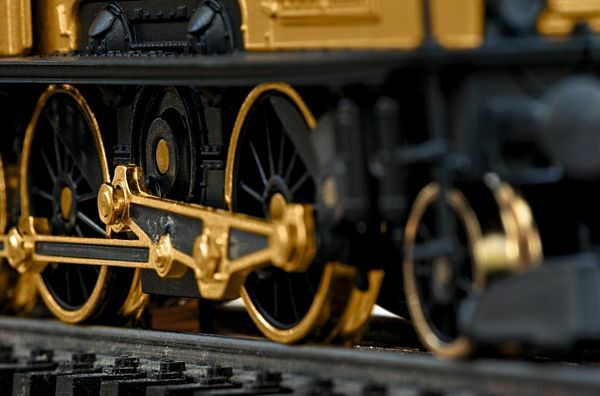 The design and pulling power of the original locomotive impressed people so much at that time that it became a synonym for progress and power. 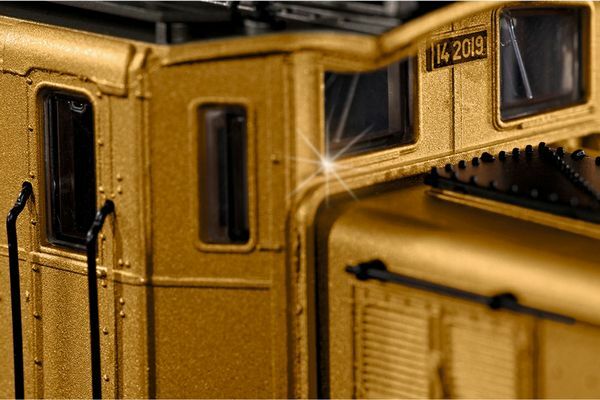 A mystique that continued through the history of Märklin. 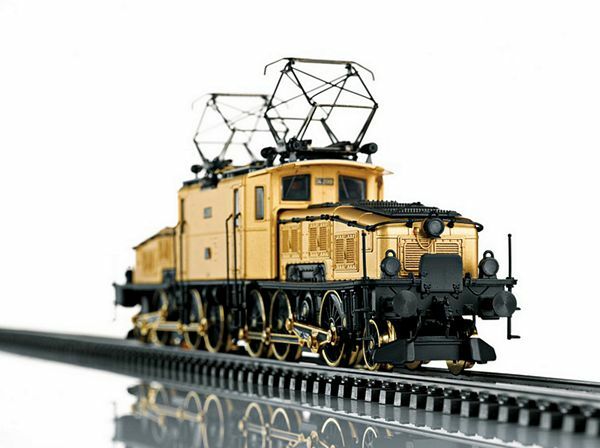 This unit was in all of the scales offered by Märklin. At first in 1 and 0 Gauge, then in H0 and even in Mini-Club Z Gauge. 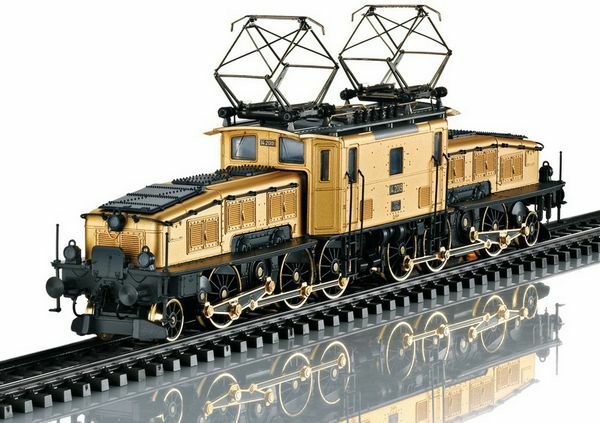 It formed the top item offered everywhere in the assortment and thus became the unofficial "heraldic animal" of Märklin. The color green dominated over the longest period of its use on the Gotthard grades and people almost forgot its original color of brown. 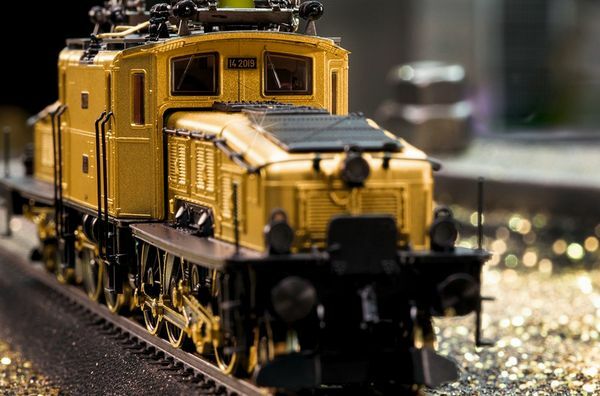 Märklin did not bring it out in brown on the market until 1984, as an offering for the 125th company anniversary, a "Crocodile" in a limited quantity, in 1 Gauge. By contrast, there never was a "Crocodile" in white in real life. Despite this a large dealer in New York ordered several units of large 0 Gauge locomotives in special paint schemes. He chose the color white that was completely untypical in the prototype. It cannot be denied that locomotives in these imaginary paint schemes have a special effect on observers. Despite this for unknown reasons, there was only this single order. This made these locomotives unique pieces seen by only a few people. Amazingly, they became very well known in collector circles. The white Crocodile thus became a part of the exclusive 31859 anniversary set in 2009 for the 150th anniversary of Märklin. 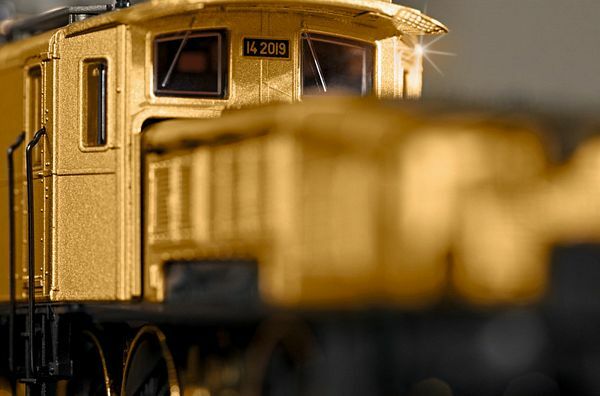 In this tradition, we want to make 2019 unforgettable in which Märklin for its 160th anniversary crowns this proud heraldic animal in the popular H0 Gauge with a unique gold edition.